BOARDING SCHOOL: Young skateboarders test the ramps and jumps at the new skate park that opened at Hilltop Park on Saturday. A county grant called Mercer At Play provided funding for the park, which involved collaborations between the Recreation Department, Borough, Township, University, Parks Alliance, and community. At a Board of Trustees meeting last week, Princeton Public Library Director Leslie Burger reported that careful planning during the last year is helping in her effort to create a no-growth budget for the coming year. The decision not to replace two full-time employees who recently resigned also figured in her calculations, along with the red-pencilling of non-essential items. The unusually large turnout for Monday evenings Township Committee meeting wasnt because of a hot-button agenda item. In addition to being the last meeting at which Mayor Phyllis Marchand would preside, it was awards night, and the families of Township volunteers and employees who had served the community for five years and more had assembled to see them being honored with gifts. A common theme that emerged from the park advocacy groups that came before the Environmental Commission last Wednesday was the need for more resources, more funding, and more visibility. Representatives from the Pettoranello Gardens, Rogers Refuge, Gulick Preserve, and Turning Basin Park gave presentations. 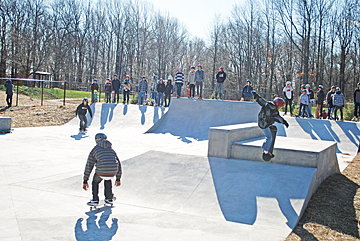 Despite freezing temperatures, some 250 young people clad in helmets and armed with boards could be seen Saturday morning taking turns on the various ramps, stairs, and quarter pipes that comprise the newly installed skating surface at Hilltop Park. Blaring music and periodic whoops of joy bounced off the walls of the Princeton University football teams locker room as last Saturday afternoon turned to evening. Last fall, the Princeton University womens cross country team flew into the NCAA championship meet ranked fourth nationally. Laura Johnson has gone through plenty of pregame warm-ups over the years but last Saturday night was special.